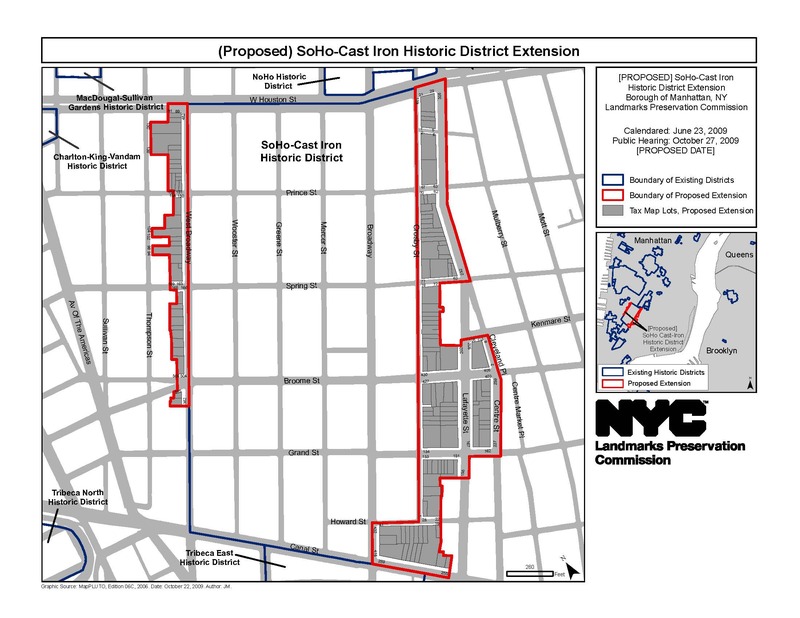 Proposed extension of SoHo-Cast Iron district. Proposed extension includes two subsections consisting of 135 properties. Landmarks heard extensive testimony on a proposal to extend the SoHo- Cast Iron Historic District to include 135 properties in two subsections bordering the east and west sides of the existing district. The western subsection includes buildings on West Broadway’s western side between Houston and Grand Streets. The eastern subsection is larger and includes portions of Crosby, Lafayette, and Centre Streets between Houston and Canal Streets. The proposed extension includes cast-iron and masonry commercial buildings from the post- Civil War era that are similar in period and style to buildings within the historic district’s current boundaries. The extension also features architecture in the Italianate, Second Empire, and Romanesque Revival styles. Mary Beth Betts, Landmarks’ research director, said Landmarks had received several expansion proposals from community groups and individuals, and noted that the submitted proposal represented the results of a staff-conducted survey. Michael Slattery, senior vice president of the Real Estate Board of New York, spoke in opposition, testifying that the buildings in the extension did not meet the standards of the landmarks law. He said the inclusion of “lesser-quality properties” would diminish the SoHo-Cast Iron Historic District. A SoHo property owner argued that Landmarks should remove the proposal’s entire western subsection. LPC: SoHo-Cast Iron Historic District Extension, Manhattan (LP-2362) (Oct. 27, 2009).